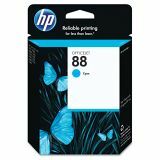 HP 88, (C9386AN) Cyan Original Ink Cartridge - HP 88 ink produces vibrant, professional color every time at a cost that's less than laser, making Hewlett-Packard's inkjet technology the preferred choice for the office. 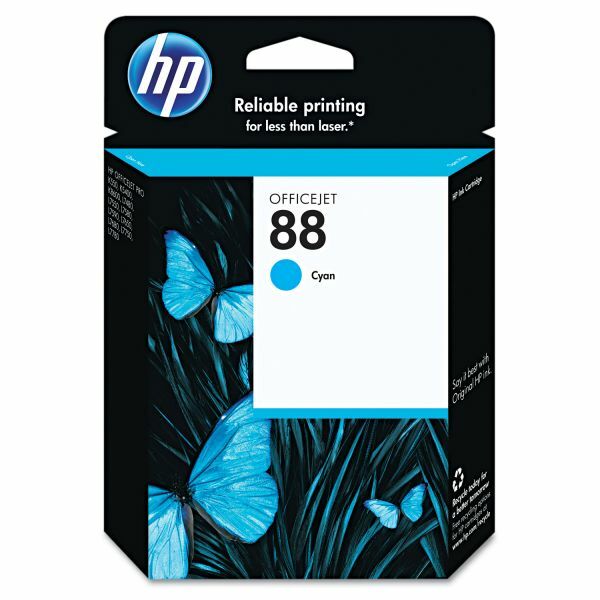 HP's proprietary inks are specifically designed to meet your office printing needs. Color dyes produce high-impact color graphics, and photos resist fading for generations. HP Smart Printing technology in HP supplies and your printer ensures reliable, consistent results by making automatic adjustments that optimize print quality. Cartridge is designed for use with HP Officejet K550, K550dtn, K550dtwn, K5400, K5400dn, K5400dtn, K5400tn, L7480, L7550, L7580, L7590, L7650, L7680, L7750, L7780, K8600 and K8600dn. 4.90" x 0.88" x 5.13"